Patients who expect their health insurer will work in their interests to contain costs by medical providers might just as well hope for assistance from leprechauns, unicorns, or the tooth fairy. The United States spends more per person on health care than any other country does. A lot more. As a country, by many measures, we are not getting our money’s worth. Tens of millions remain uninsured. And millions are in financial peril: About 1 in 5 is currently being pursued by a collection agency over medical debt. Health care costs repeatedly top the list of consumers’ financial concerns. Experts frequently blame this on the high prices charged by doctors and hospitals. But less scrutinized is the role insurance companies — the middlemen between patients and those providers — play in boosting our health care tab. Widely perceived as fierce guardians of health care dollars, insurers, in many cases, aren’t. In fact, they often agree to pay high prices, then, one way or another, pass those high prices on to patients — all while raking in healthy profits. For three decades, Frank has worked for insurance companies like Aetna, helping to assess how much people should pay in monthly premiums. He is a former president of the Actuarial Society of Greater New York and has taught actuarial science at Columbia University. He teaches courses for insurance regulators and has even served as an expert witness for insurance companies. The hospital and insurance company may have expected him to shut up and pay. But Frank wasn’t going away. Instead, this patient challenges the hospital and insurer in every way he can, demanding and receiving huge stacks of billings from his case, which he then attacks, item by item. He finds himself hit with charges for “physical therapies that never took place and for drugs he never received,” Allen reports. He contests the costs the hospital charges him for surgical hardware, sums exceeding $26,000 but which he finds by going back to the device’s makers might more properly amount to $1,500 ── the amount his surgeon confirms he was charged for the implanted materials. Allen says Frank figures he spent more than 300 hours, acting as his own expert advocate in contesting his surgical charges, a dispute that would fill several 2-inch binders with bills, records, and correspondence about his case. Allen reported that Frank found a constant during his quest to lower his medical bill: His insurer offered zero help. The company said it had negotiated, hard, its final and fair price for him, and, if he had wanted a lesser charge, he should have considered surgery at another hospital. Frank learned after the fact just how big the differences can be in hospital charges for the same procedure (but more about that in just an instant). Allen also details, however, how difficult it can be for patients to shop around. In my practice, I see the huge harms that patients suffer while seeking medical services, the huge havoc that can be wreaked on them by dangerous and defective devices, including those of the medical kind, and their giant struggles to access and afford safe, excellent medical care ── even if they may have health coverage. I won’t give away what happens in the saga of Michael Frank and his hospital bill. I will say that a painful part of Allen’s story focuses on how not just individual patients but also big companies and their CEOs get stung by doctors, hospitals, and insurers, and the nation’s skyrocketing medical costs. 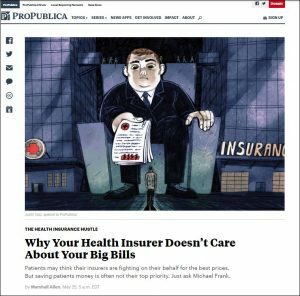 Most Americans get health coverage through their employers, and companies have howled about paying these ever rising costs, while also shoving more of them on to patients, for example, with now staggering and high deductibles. Insurers, meantime, simply must as middlemen, mind their p’s and q’s and do calculations correctly ── so they charge a large number of customers sufficiently profit-raising premiums so as to cover any costs incurred by the relatively few of us who tap insurance for medical services and care. If doctor and hospital costs head for the moon, for insurers, it’s no problem: pass on the costs to customers, individuals and companies. As NPR rightly describes it in a headline on Allen’s story, it’s a great “hustle,” except all of us pay for it. Premier, using its database on more than 1,100 hospitals, scrutinized more than 280,000 patient discharges at 869 hospitals from October 2015 to March 2017, finding that joint replacement surgery can cost as little as $5,000 or as much as $30,000, depending on the hospital. Premier found that the cost differences were the result of different implants hospitals used and how they performed the procedures. Among 350 hospitals, the average cost of primary knee implants was $4,464. Yet, 50 percent of the hospitals paid between $4,066 and $5,609 on the devices. Further, the same group of hospitals paid an average of $5,252 for primary hip implants, but 50 percent of the hospitals paid between $4,759 and $6,463. … According to the analysis, the providers could save $23.7 million on knee implants and $19.1 million on hip implants if they paid the same amount for implants as the top 25th percentile of hospitals. Total joint replacement surgery is one of the most common procedures performed in the U.S. More than one million joint replacements are performed every year in the U.S., and by 2030 that number is expected to grow to more than 4 million. Yes, but … With baby boomers racing to fix bad knees, hips, and shoulders, taxpayers are footing increasing costs for these procedures, and they’re not the waltz that too many doctors and surgeons make them out to be. Premier has found that hospitals can reduce joint surgery costs, for example, by showing doctors how much greater their procedures cost than do operations by their peers. This purportedly helps to fire up surgeons’ competitive nature, leading them to think about the hardware (medical devices-implants) they use, though, to be sure, many of them get paid by makers to use specific types and brands. Premier also said that institutions have had success in cost-cutting by getting surgeons to consider operating with local rather than general anesthesia ── an idea that many more patients are receptive to than doctors tend to think. Orthopedists and hospitals also need to scrutinize their operating room staffing, as too many practitioners insist on working with too many unneeded people in the OR. If you think it’s easy for patients to comparatively shop, though, Premier identifies another factor in high and varying joint replacement costs: whether surgeons use a more expensive, though not necessarily safer bone cement containing antibiotics. Really, if I’m a hobbling senior seeking greater mobility and pain relief, someone expects me to ask a hospital and a bone-groan about an item like this? We clearly have a far way to go to make fairer, more rational, and affordable medical costs. What a shame that insurers ── a critical player in the middle of so many financial exchanges in medicine, with extensive knowledge ── does so little to help its beleaguered customers. Regulators really need to ask why and to figure how to fix this.